Cirlock has released its new ready made energy source lockout labelling system - the CIRLOCK LOCKOUT-ID. 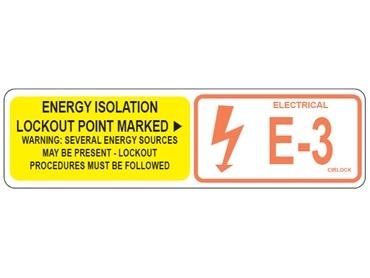 Designed by Cirlock, this unique energy source lockout labelling system makes it simple to identify and label all energy sources to plant and machinery, in small or large workplaces. Isolation and lockout of energy sources during repair and maintenance becomes simpler and safer with the CIRLOCK LOCKOUT-ID as it helps to identify hazards and avoid accidents. This energy sourch lockout labelling system includes eight different standard energy sources, all available with numbers 1 to 100 and colour coded. All sets comes with one large label to be placed somewhere on the energy source, such as the valve or circuit breaker, and smaller corresponding labels to be placed on machine for easy identification. A Lockout Label Chart for large equipment is also part of the system. The CIRLOCK LOCKOUT-ID energy source lockout labellng system is designed and made in Australia by Cirlock, and is available from your local electrical and other wholesalers.